WWT Welney Wetland Centre01353 860711work Nature ReserveSpread your wings at WWT Welney Wetland Centre and spend a day exploring the wetlands in the heart of the Fens. Your wild adventure is enhanced by the comforts found in the visitor centre. Begin your day with breathtaking views over the Fen landscape from the cafe. Here you can spy hares boxing, and water voles in spring or the elusive water rail in winter, all with a nice cup of tea or coffee. A walk across the footbridge brings you to the first and largest of the hides; where commentated swan feeds can be enjoyed during the winter months. There is no need to worry about getting chilly; this centrally heated hide allows you to watch the swan spectacle in comfort. In the summer months watch house martins and swallows raise their young in front of you. Exploring the wider reserve will give you access to four further hides, from which you can watch thousands of ducks and wading birds in winter or chicks and duckling taking their first steps in summer. Along the footpaths look out for butterflies, bumblebees and dragonflies, or find out what lives beneath the surface at the pond dipping stations. Enjoy swathes of colour as wildflowers line the summer walk, and totally immerse yourself in the tranquillity of the wetlands at this furthest point of the reserve. Everything you need for an unforgettable day out. Our Wigeon cafe offers the chance to enjoy home-cooked food whilst looking out on fantastic Fenland views. Our bright, big-windowed café comes with a gorgeous panorama over the stunning wetlands of the Fens. There's space for everyone - friends, families, groups - to enjoy freshly-cooked food and Fairtrade hot drinks to tickle all tastebuds. Grab a cold snack, sit-down with a hot meal and enjoy views to dine-for. Open from 10am daily. Wheelchairs are available on site with good access to the visitor centre, bridge, centrally-heated main observatory and many hides and walkways. A hearing loop exists in the visitor centre and main observatory. Something for everyone - bursting with luxury gifts, gorgeous greeting cards, sterling souvenirs, as well as the latest wildlife books, bird care essentials, and Opticron telescopes and binoculars. Plus, optics specialists, In Focus, hold sales here throughout the year, and are happy to guide and advise you on equipment. 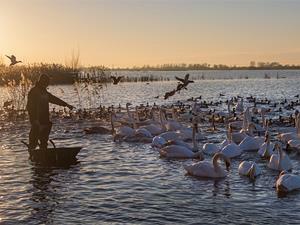 Spread your wings at WWT Welney Wetland Centre and spend a day exploring the wetlands in the heart of the Fens. Your wild adventure is enhanced by the comforts found in the visitor centre. Begin your day with breathtaking views over the Fen landscape from the cafe. Here you can spy hares boxing, and water voles in spring or the elusive water rail in winter, all with a nice cup of tea or coffee. Open daily 10am-5pm. Late opening until 8pm from Nov-Feb every day except Mon, Tues, Wed & Christmas/New Year holidays. Last admission is 4.30pm. Admission; Adult £8.20, Child £4.00, Concessions £6.30, Family ticket (2+2) £21.95.